Every September after Labor Day, a sense of stillness descends on the Bishop Creek Canyon. The kids are back in school, the family vacationers have come and gone, and the hustle and bustle of the summertime gives way to the relative peace and quiet of fall. It is during this time that serious trout anglers, the ones who are really in the know, head for the high country. Mild days, crisp cool evenings, light crowds, gorgeous fall colors and exceptional trout fishing are dead giveaways that autumn has arrived. Still, it’s safe to say that vast majority of area visitors miss out on what many consider to be hands down the best time of the year in the High Sierra. So, you may be asking yourself “what’s so great about the fall?”. Well, there are a lot of reasons that September and October are exceptional but the biggest reason for anglers is simple …just as many fish, a fraction of the anglers. 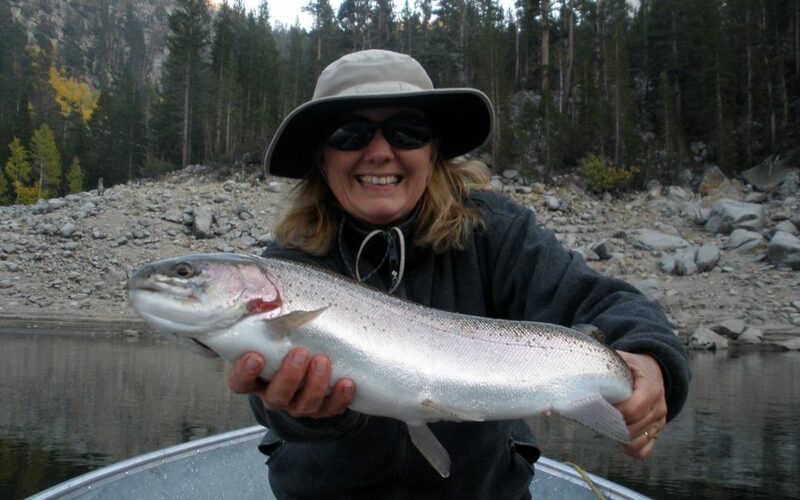 The California Department of Fish and Wildlife continues to stock South Lake, Lake Sabrina, North Lake, Intake II, Weir Pond and both forks of Bishop Creek all the way through October, not to mention another bonus stocking of gorgeous trophy Rainbow Trout from Desert Springs Trout Farm coming in late September. With the light fall crowds, there are simply more fish per rod to catch and less anglers to compete with. Water conditions in 2016 have far exceeded our expectations with levels at South Lake and Lake Sabrina nearing normal conditions, a wonderful surprise for locals and visitors alike. Not only did the water rise higher than expected at our favorite reservoirs, but the water has stayed high much longer than expected leaving anglers with plenty of fishable water and allowing for continued weekly or bi-weekly fish stocking. In addition to the stocked Rainbows, all canyon waters have self-sustaining populations of wild Brown and Brook Trout. While these wild species of trout are occasionally caught during the summer months, Brown and Brook Trout spawn in the fall making them far more aggressive and easier to fool come September and October. We always recommend practicing catch & release on these wild trout since the DFW no longer stocks them. 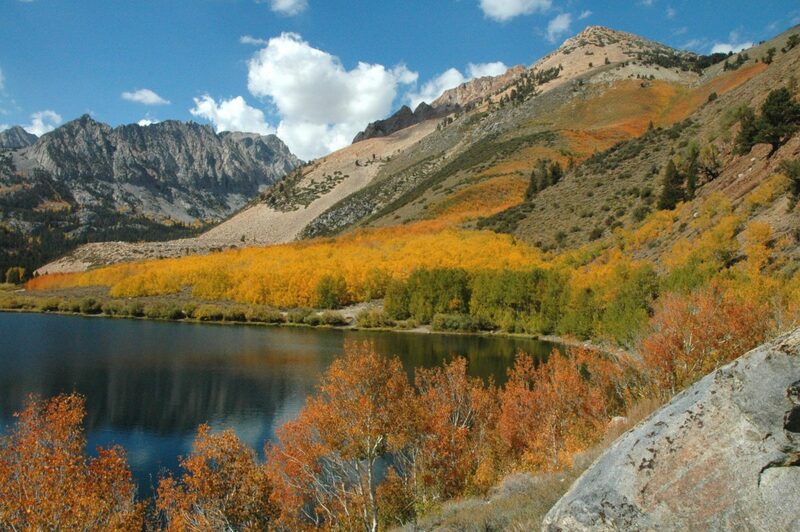 Backcountry fishing in the fall can also be spectacular with nearly fifty different lakes in day hike range in the Bishop Creek Drainage, all of which hold wild trout. 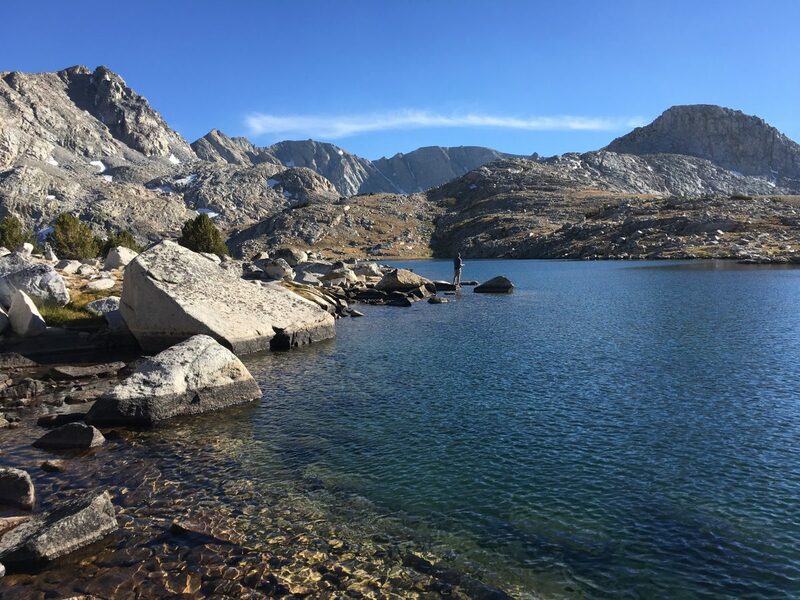 There are five trailheads in the canyon (Tyee Lakes, Bishop Pass, Sabrina Basin, Piute Pass, Lamarck Lakes) which all lead to pristine trout-filled lakes. 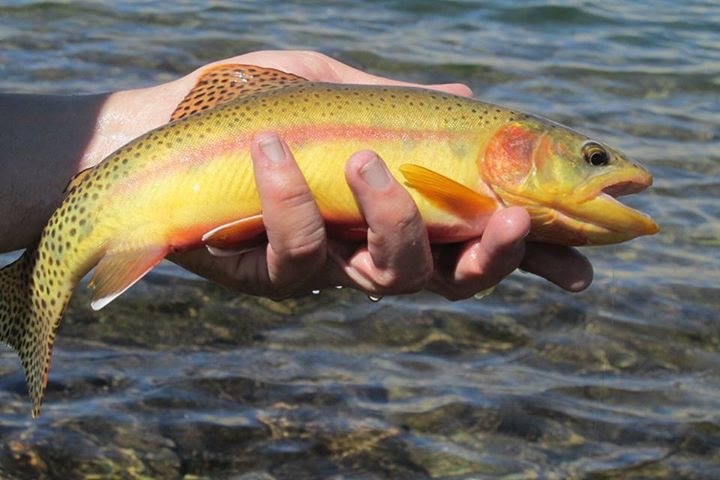 These backcountry fisheries hold wild Rainbow, Brook, Brown and even Golden Trout. With the cooler weather, these trout know that winter is on the way and are often easily fooled by a well casted fly or lure. Although the stillwater fishing in the canyon is certainly epic, the creek fishing is not to be passed up. Some folks may not realize it, but there are nearly 20 miles of fishable stream on Bishop Creek from the highest elevation near South Lake down to the lower elevations in town. Creek flows this fall are nearly perfect making the best pools and runs ripe for the fly or spin fisher. Artificial lures and flies are extremely productive this time of year, but drifting a nightcrawler or salmon egg in the stream will surely entice a strike as well. While the fishing alone makes a late season visit to the Bishop Creek Canyon worth the trip, there is so much more to it than that. It’s the friendly faces of the other folks lucky enough to have chosen the fall as their time to visit the canyon. It’s the scenery, the serenity, the sound of an autumn breeze shaking the aspens as it blows through the canyon…it’s perfect. It’s arguably my favorite time to be here. It’s the time of year that reminds me just how outrageously lucky we all are to be able to visit this place, for an afternoon, for a day, for a week. It’s the time of year when there is literally a postcard quality views in every direction and you simply can’t be here without being humbled by the grandeur of it all. Fall is the time….awesome autumn in the High Sierra. 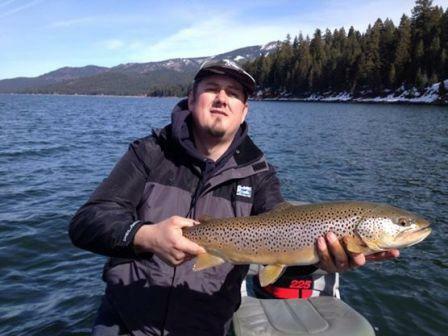 For more info on fishing near Bishop, click HERE. For more information on visiting the Bishop Creek Canyon, please contact these fine local businesses. As General Manager of the Parchers Resort & South Lake Landing, Jared is dedicated to providing resort guests and area visitors with a tremendous outdoor experience.